Newton Review: A uniquely funny niche film for the niche audience! Filled with some dark and some funny moments, Newton makes for a perfect watch for the niche audience. Read here full Newton movie review before booking your tickets. 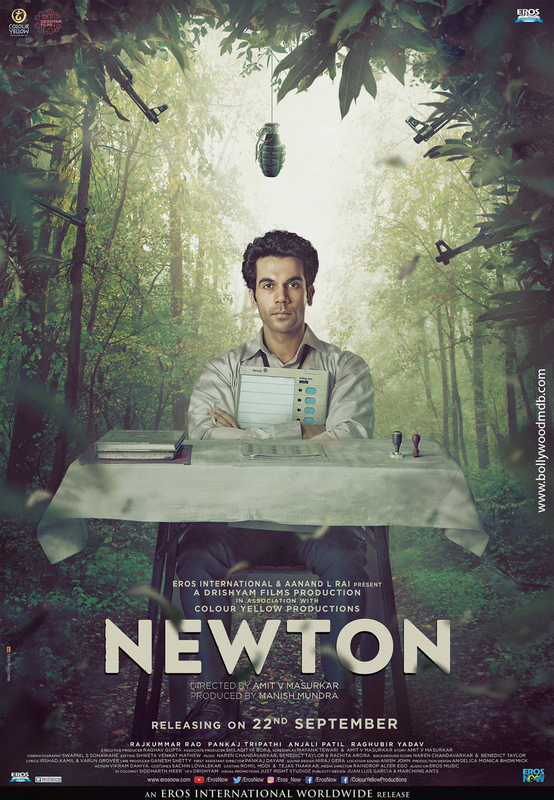 Newton revolves around Newton Kumar (Rajkummar Rao), a middle-class, government employee who has just joined his duty. Meanwhile, he has also been given the responsibility of conducting fair and impartial election in an area which is a stronghold of naxals. When he reaches the village, innumerable challenges await him, the most prominent one being a possible guerilla attack by rebels who don't want any kind of elections there. Newton is determined to accomplish the task assigned by his seniors, but the people he has decided to fight against are not less dangerous. Police officer Aatma Singh (Pankaj Tripathi) and his battalion help him and his team to perform the elections, but their intentions are too vague to be believed. In this scenario, will Newton be able to perform his duty fearlessly? How will he go about conducting elections in an area which is rebel-threatened and anti-establishment? Find these answers after watching the film this Friday. When a film features actors like Rajkummar Rao and Pankaj Tripathi, you just can't imagine it to be a film low on performances. Rajkummar Rao is an actor who becomes the character he plays on screen. Here he is seen in and as Newton, a government rookie sent to a naxal hit village to conduct fair elections. Rao gets into the skin of his character and showcases a sincere performance. Pankaj Tripathi, on the other hand, adds comic moments to the film. Though he doesn't look very convincing in the role of a police officer, he woos you with his perfect comic timing. He is an effortlessly brilliant actor. Anjali Patil doesn't have much to do, but she is good at whatever she does in the movie. Raghubir Yadav is also good in his role. After debuting in Indian cinema with the 2014 film Sulemani Keeda, director Amit Masurkar returns to direction with his second movie Newton. While his debut film dealt with the struggle of two screenwriters in Mumbai, he chooses a Naxal hit area of Chhattisgarh to base his second film in. His direction style is unique and so is his storytelling style. Newton talks about many grave issues India is facing even after 70 years of its independance. We are called the biggest democracy in the world. But does that achievement ensure that everything is democratic in our nation? With his film Newton, Masurkar talks about things which are blatantly undemocratic in our country. You will appreciate his efforts for telling a story which many filmmaker won’t even touch. But the main problem is that Newton is not a film for everyone. It is not that mass-appealing film which majority of the audience wants to watch. Since the movie is shot on real locations, it adds to its authenticity. Cinematographer Swapnil Sonawane succeeds in capturing various virgin locations of jungles in Chhattisgarh. Editing is not up-to-the-mark. Except one song ‘Chal Tu Apna Kaam Kar Le’, which comes at the end as credits role, there is no song in the movie. Whatever is there is background music which gels well with the mood, feel and narrative of the film. You can watch Newton if you are a Rajkummar Rao fan or love indulging yourself in cinema which is esoteric. If you have a thing just for commercial, potboiler sort of films, Newton is not for you. The nominations for the 63rd Filmfare Awards are out and Rajkummar Rao and ‘Newton’ are major missing!